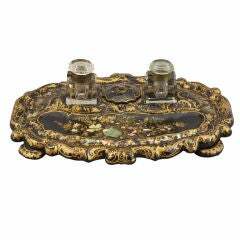 Exquisite serving tray features a variety of exotic materials and is all handcrafted. 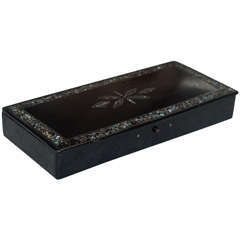 Covered in shagreen with hues of tan, and features mother of pearl inlays over palmwood insets. The combination creates a beautiful concentric and geometric design. Fitted with stylized handles in bronze. Both decorative and functional and makes an excellent addition to any serving set, or barware collection. Rare find as R&Y Augousti is no longer in production. Fine mid-19th century inkwell with inlaid mother-of-pearl decoration surrounding pen trays, a lidded compartment and two crystal inkwells. The whole raised atop four flattened bun feet. 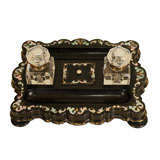 Sophisticated Gentleman's club tray from the Art Deco period circa 1925, Belgium. Hand embossed brass sunburst design set into an oak wood frame with two cast brass handles. 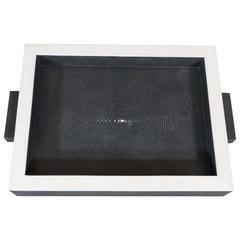 Onyx shagreen tray with bone trim.